Sinfully nice Carrot Cake. The sticky type. You can find sinful carrot cake here. This stall sells a few varieties of Carrot cake. The Normal type ($2.50) and the prawn type as well as the squid type. The normal type is an all time favourite. Available in both Black & White, I prefer the black version. 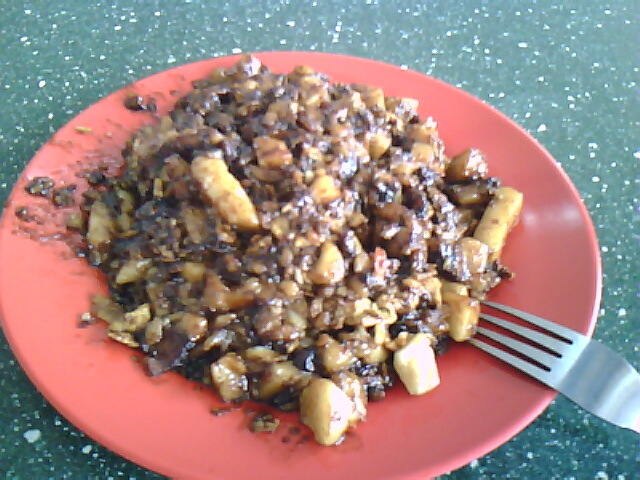 They use the dark soya sauce that it rather thick, resulting in a sticky carrot cake. Do try the version with some chilli. Its heavenly. What I especially like is the tiny bits of carrot cake. The man tends to chop up the carrot cake so you can get a lot of tiny bits along with some chunkier ones. They are quite generous with the salty veg too. The carrot cake is not served with garnish like spring onion / parsley. The stall holders are friendly and their service is fast. They normally open rather early in the morning (around 9?) & close by 7 -8pm when they are sold out. From my experience, I believe they are closed on (some) sundays.